Cleaning old 45 RPM records is necessary to maintain the quality of the record and the sound. When kept free of dirt, dust and oils from your fingers the sound will not only be clearer, the record will last longer. Purchasing a record cleaning machine is the quickest method but unless you have a large collection the cost factor may be prohibitive. You can clean them at little or no cost by creating your own cleaning solution. Mix up a solution of one part 90 percent isopropyl alcohol, four parts distilled water and five drops of nonmoisturizing dishwashing soap. Apply the solution to a clean paper towel. Sweep the paper towel around the record following the grooves. Repeat as necessary. Rinse off the record with plain distilled water being careful not to get the label wet. If you do get the label wet, blot, do not rub, to remove the moisture from the label. 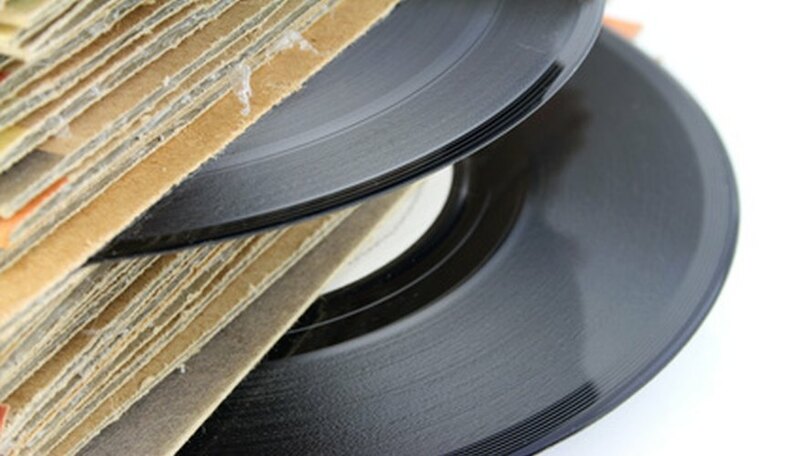 Dry the record with a clean, soft bath towel by rubbing gently, following the grooves. Set the records on a clean towel, propped up against something and allow to dry for a couple hours. The time will vary depending on the humidity in the air. Place in a clean paper sleeve once completely dry. Before and after listening to your vinyl records clean them with a carbon fiber brush designed for records to remove small particles of dust and lint. Do not listen to records until completely dry. Playing a damp record can cause damage to the record.